Iconic is a term often over-used. In the case of Ridge Vineyards it is entirely appropriate. Their instantly recognisable label design is, literally, an icon. The reputation of their Monte Bello Bordeaux blend simply confirms that status, and this northern California institution is truly one of the stars of US wine. They are, dare I say it, my favourite producer in North America. Led by Paul Draper since its foundation in the 1960s, at the Monte Bello estate in the Santa Cruz Mountains south of San Francisco, Ridge has built a reputation for excellence in 3 directions: top-flight Cabernet Sauvignon blends, benchmark, age-worthy Zinfandel blends and top-class Chardonnays. They now make around 30 wines a year, most of which are in fact Zin-based wines, representing 65% of production, and some are only available through their mailing list. Though Eric Baugher has gradually taken over leadership of winemaking, his more than 20 years alongside Draper mean a continuity of quality and of style. For wines of the Monte Bello estate, that means combining the ripe fruit of California with the freshness of the Santa Cruz Mountains, delivering balance and elegance to their top Monte Bello reds and whites, but still with a California signature. Wines of place indeed. For their Zinfandel blends, there is again rich fruit, but restraint of alcohol ripeness and above all, capacity to age as a result of their tannic structure and flavour depth. That’s particularly notable in their two northern Sonoma estates of Lytton Springs and Geyserville, each based around old vine, interplanted blocks of Zin, with an array of other varieties like Carignan, Alicante Bouschet, Mourvèdre, Petite Sirah and even a little Pinot Noir. At 10 or 20 years of age, these can be very much alive and drinking beautifully. Also, a stylistic signature is their belief in American oak for their reds, which gives a distinctive dimension to both the Cabernet and Zinfandel blends, at a time when some other producers are moving to French oak. 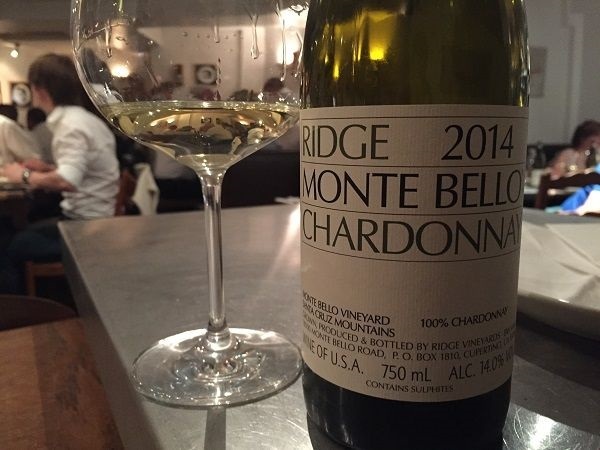 It’s only with Monte Bello Chardonnay that French oak is more suited and plays a role. And as for that iconic label – it’s the same label as was originally designed in the 1950s & 1960s, apart from increasing the font size for visual accessibility. The estate was founded by scientists and their clarity of mindset underpins the simple and clear lines of the label. That scientific mentality extends to a refreshing clarity and openness about the technical details of the winemaking. The back labels explain how the wine was made and what has been used or added, to inform consumers. Their blog is equally transparent and informative. It’s noteworthy that the UK is their most important export market and has long embraced the Zinfandels as well as the Monte Bello wines. My perspectives on Ridge have been built up from a combination of visiting Lytton Springs in 2013, then two separate Planet of the Grapes wine dinners with Eric in 2015 and 2018. In 2015 particularly, Eric showed his generosity and openness in explaining not just their philosophy but also their viticulture and winemaking. A planned visit to Monte Bello in October 2018 with a group of MWs should only expand on this. Eric originally studied Biochemistry & Molecular Biology. He was brought in by Paul in 1994, to set up a state-of-the-art lab for the winery but ended up staying to make the wine. In 2015 he had been VP of Winemaking for over a decade, and by 2016, became COO and Monte Bello winemaker. Ridge’s philosophy starts in vineyard, to achieve vine health and balance during the growing season, then get the right harvest date for optimum ripeness. Now of course, one man’s optimum is another man’s overripe, so what does that mean? For Ridge, it’s the starting point for a degree of restraint. For example, their sweet-spot for Zinfandel is 14.1-14.5% potential ABV, to get the right level of phenolic ripeness without the often excessive alcohols that later-picked Zin can achieve – upwards of 17% from some producers. This also retains freshness that again is a stylistic marker for Ridge. Getting optimum ripeness means picking and vinifying plots and parcels separately, with blending only after fermentation. Blending is based on getting the most focused flavours that are typical of that site, reinforcing the sense of place that their wines have. Of course, there are cooler and warmer harvests in California, which present challenges in any given year. That’s particularly marked at altitude in Santa Cruz but occurs across the region. For example, 2010 was heavily green harvested in both Monte Bello and Sonoma, to manage a cool early period of the growing season and a wet ripening phase. Wet fogs and mildew had attacked the Zinfandels, so they pulled leaves to open the canopy, ventilate the clusters and dry out the fungal attack… only for 2 days at 117°F to arrive and produce sun scorched fruit. Only 15% of the Zinfandel fruit was good enough to be harvested. As Cabernet Sauvignon has more open clusters and thicker skins, less leaf-plucking is generally needed – and none on the hotter, west-facing rows. The big, longer-term viticultural challenges they see are Pierce’s Disease, plus Eutypa to which Cabernet Sauvignon is particularly vulnerable. In each case, affected vines are treated by pruning away infected wood, but 1-2 vines per Ha are still lost each year to Pierce’s Disease. Here they are also trying to control the glassy-winged sharpshooter vectors by dusting with white volcanic powder and encouraging predators. Finally, it’s worth noting their sustainability philosophy in both the vineyard and winery. Solar panels have been installed to minimise fuel usage – though they are on the electricity grid, even in the mountains of Monte Bello, that doesn’t cover heating etc. Likewise, technology has been installed to recycle water by treating and re-using water from barrel washing and winery cleaning, for example. Water supply is an issue for Santa Cruz as much as the rest of California, where the Santa Cruz Mountain range has risen 1cm as a result of the reduction of weight from a falling water table in the area. Ridge has established new boreholes on the estate to guarantee their limited water resources, alongside the recycling initiative. As highlighted, Zinfandel blends are the mainstay of production, at 65% of volume. Zinfandel production started in the Santa Cruz Mountains in the 1960s and were made like Cabernet in an extracted, structured style. 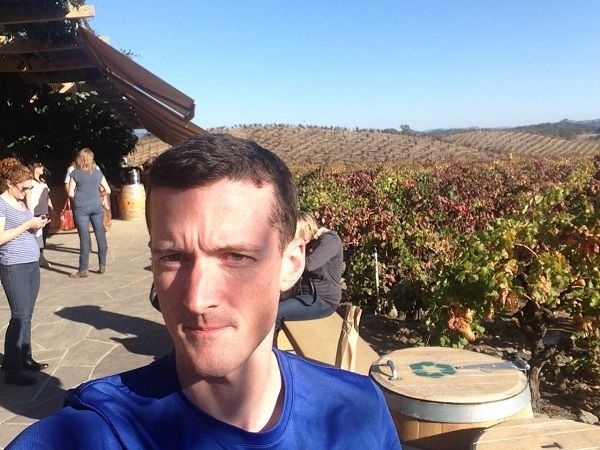 But this has since moved on, not only in location – mainly in and around Sonoma, where temperatures are around 10°F higher – but also in winemaking, with more suppleness and refinement. Ridge purposefully seek old very old vine plots, where available, though have planted their own vines too. The Geyserville estate, for instance, was planted in 1882 in the Alexander Valley in northern Sonoma. Unusually it wasn’t ripped out during Prohibition, as the family who owned it couldn’t bear to lose a vineyard that made such good wines. The original plot is interplanted and the estate has 23 different varieties to choose from, resulting in a multi-variety make-up of the wine, that varies each year. Nevertheless, Carignan is normally a significant proportion, as it is a major component of that original, interplanted plot. Overall, they have 330 acres of Zinfandel in Sonoma. These are bush vines, so need to be hand-picked, and significant selection is done at the vine – around half the crop will be dropped during the ripening season and at harvest – as well to avoid overripe or shrivelled berries. As explained above, physiological ripeness is hard to get at under 14% ABV, whilst over 15% they believe ageability and food-matching declines rapidly. The sweet spot is then 14.1-14.5% ABV, supported by tasting in the vineyard to avoid both green flavours and sharp acidity. However, hand picking requires a team of at least 100 people for a typical harvest, including paying standing wages to keep them on-hand, due to labour shortages in California. But even that was not able to cope with a sudden heat spike of over 100°F temperatures in the 2014 harvest. Then, raisining was so rapid that picking couldn’t be done to hit the ideal ABV. 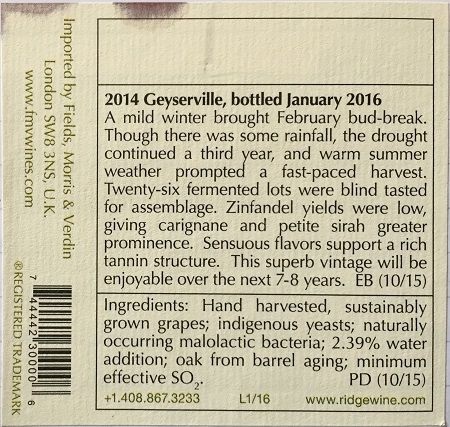 The brilliantly-honest and clear back label of Geyserville 2014 revealed the solution – addition of 2.39% water, to get back to a better-balanced 14.5% ABV from around 14.8-14.9%. This is a lovely Geyserville and demonstrates why this approach, now legal in California up to 7%, makes sense when used appropriately. 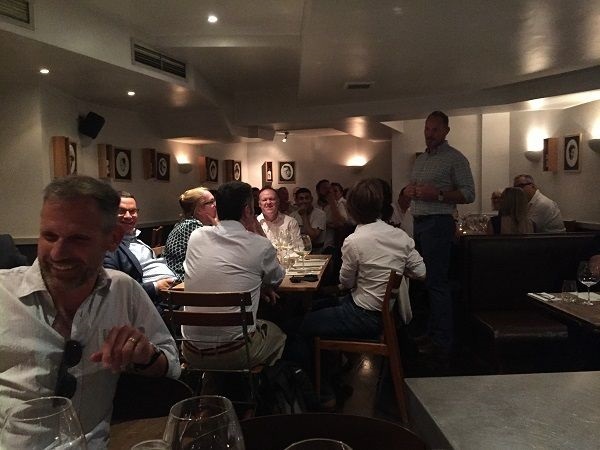 Alternatives, like Reverse Osmosis, of course exist, but previous tests Ridge made demonstrated a significant flavour change that removed the wine’s varietal and locational identity – “it just tasted like red wine”. Watering-back therefore seems like an eminently sensible solution to the problem, without unduly compromising quality. Their other top Zinfandel estate is Lytton Springs, planted in 1901 near Healdsburg in north-central Sonoma, and acquired in the early 1990s. Again, this is a multi-variety estate with 19 different planted, including a small amount of pre-Phylloxera Pinot Noir that is now being investigated and propagated for the possibility of a Pinot Noir from Monte Bello in future. Petite Sirah is typically 15-20% of the Lytton blend as that was a major part planted originally and there is a 100% Lytton Petite Sirah bottling made separately. Prices for Petite Sirah fruit have recently risen to $6,000 / ton as it has become popular for adding tannic structure to Napa Cabernets. I find Lytton consistently produces more tannic, structured wines that mature more slowly than Geyserville, but mature brilliantly, as demonstrated recently with a 1996 drunk in 2018 that was fantastic. Geyserville too does last, having had a mid-maturity 2003 later in 2018. Eric’s view is that it is Lytton’s hard, iron-clay soils that deliver that greater structure alongside a creamy, clay-like aromatic signature. Geyserville, by comparison, is on an old gravel riverbed, delivering both its more supple tannins and a crushed rock aromatic mineral note. In both cases, vines are dry-farmed and each year, 30-40% are declassified into their Sonoma County Zinfandel bottling. So when should Geyserville be drunk? When should Lytton Springs? Though certainly carrying enough fruit intensity to be enjoyable straightaway, particularly Geyserville, I think they develop complexity and suppleness over time. I would therefore suggest approaching Geyserville from about 5-6 years of age and Lytton 7-9, to get them really on song. That 22 year old Lytton and 15 year old Geyserville shoed that their peak windows after that are long – perhaps 10-15 years, reliably. Other Zinfandel labels include Pagani Ranch from 113 year old vines, with most from the original planting, and more recently planted vineyards like Carmichael or the unusually 100% Zin, East Bench Zinfandel. Field-blends are co-fermented. They experimented between co-fermenting mixed-plantation blocks, and separately picking and vinifying, then blending each variety. Co-fermentation produced consistently better results, so they have persisted with that since. Though some plots need acidification, Geyserville gives high-acidity wines despite having a comparatively warm climate, due to low Potassium content in its soils. As a result, Geyserville Zins don’t just have natural freshness, but in some vintages can have a pH as low as 3.1, and therefore need de-acidification. For maturation, they believe American oak spice components complement the natural Zin spice. However, to avoid dominating the Zinfandel character, a maximum of only around 20% new oak is used, mainly from the Ozarks and Appalachians. They have not tested French oak with Zin though. The Monte Bello estate is in the Santa Cruz Mountains AVA, to the south of San Francisco. These forrested, relatively sparsely-populated peaks have a combination of cloud influence and altitude to bring a natural restraint and freshness to the wines made there. Monte Bello is no exception to this. In fact, its cool climate location, combined with fractured limestone geology gives marked acidity on all Monte Bello wines. Chardonnay is planted on north-facing slopes for acidity, while Cabernet Sauvignon and the other Bordeaux varieties are on the sunnier, south-facing slopes. There are over 40 plots of Bordeaux varieties – mainly Cabernet Sauvignon, but also Merlot, Petit Verdot and Cabernet Franc. Chardonnay is only 3-5% of total production and is the first harvested, normally in early-September. Interestingly, the estate’s Chardonnay, planted by the previous owners is the high-production, low quality UCD 4 clone. They have tamed this clone and achieved quality through a combination of the very poor soils and dry farming, forcing the vines into balance. Nevertheless, Chardonnay can come in with TA values at up to 11 g/L at harves, requiring de-acidification with the double-salt method. Even the Cabernet Sauvignon-based reds can be harvested with 9-10 g/L TA and a pH as low as 3.2. With little Malic acid, MLF has minimal impact on pH, meaning the reds sometimes too have to be de-acidified down to a more conventional pH of 3.4. That’s red wines. In California. De-acidified. Cabernet Sauvignon typically comes in in late-October, at 23-24°Brix and 20-24 HL/Ha yields. However, harvest can run into November in the Santa Cruz Mountains, such as with the cool 2011 vintage. 2014, by contrast, was an early-enough year that all harvesting was over by the end of September. That’s despite getting only around 5 tons picked during a full day’s harvesting because of the slopes on Monte Bello’s hillside vineyard, making 2014 a busy year! In the winery, Chardonnay vinification is classic Burgundian. Whole cluster pressing direct to French barrels is followed by 100% barrel fermentation. Barrel maturation follows, with lees stirring for richness. For the reds, parcels are fermented separately and remain separate until MLF is complete in barrels. Throughout the vinification process, lab analysis is done to ensure good stability, first verifying fermentation completion, then MLF completion and finally that there is no microbial content. Cellar sampling and analysis is therefore conducted 12-15 times a month. During this time, the reds are racked every 3 months and around 5 times in total during elevage, to clarify pre-bottling. Egg white fining may be done to soften tannins, for example the 2003 Monte Bello was very tannic, so 3 egg whites per barrel were used, and Eric now wishes he’d used more! There is normally no filtration or occasionally just a light one, to finish the wine. Barrels are constantly topped-up to avoid acetic bacterial colonies developing and producing VA. Around half a barrel of Monte Bello (worth $50,000) per month is needed to top-up all the Monte Bello barrels. This combination of racking and topping-up allows minimal SO2 addition and they believe they achieve around 25% of the total SO2 levels of many of their competitors. Having said that, they will actually accept limited exposure to Brett and VA, as this can add character compared with a fully sterile hygiene regime, but they prefer absence. After 5 months, they blind taste Cabernet Sauvignon, Merlot, Cabernet Franc and Petit Verdot separately to assess quality. Each glass is scored for intensity, flavour of the soil or place, and ageing potential. Typically 60% of Cabernet production is de-classified into the Estate Cabernet, with 40% making the grade for Monte Bello. The Estate Cabernet used to be a 50:50 Merlot : Cabernet Sauvignon blend, but since 2008 became a varietal-labelled Cabernet Sauvignon only. 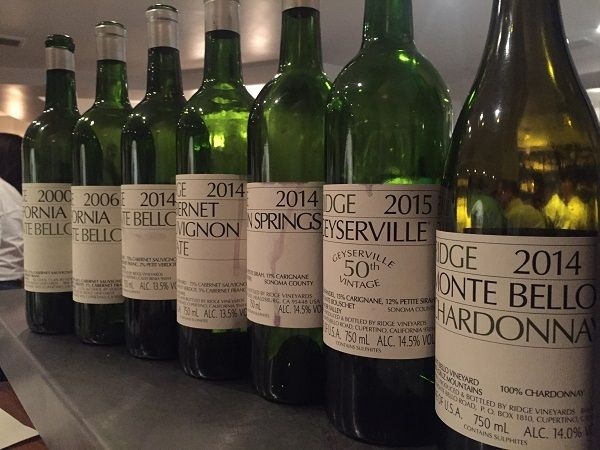 Test-blendings for Monte Bello are then done, which are compared with the last 10 years of Monte Bello vintages. They are looking for velvety, palate-coating tannins, over bitter and astringent. Collectors are involved, as collector assessments are considered more important than critic assessments. At the 2014 En Primeur tasting for long-standing collectors, for example, 2014 showed to be a promising vintage in a year that was difficult for many premium Cabernets, especially further north in Napa where the vintage is not generally considered promising. Monte Bello can often differ significantly from Napa, particularly with their comfort with lower ABVs and more freshness. In cool and wet 2011, they were able to harvest a decent quality of Monte Bello, while Napa vintners mostly aimed for later hang-times to get additional ripeness. Instead, Napa producers ended-up with 25°Brix but no flavour ripeness and rot. With fruit costs still at $15,000 / ton, many producers were left unable to make enough good wine to cover that cost. On the subject of that tolerance for comparatively lower ripeness, it is interesting to note that the 1971 vintage that went into the famous Judgement of Paris was just 12.2% ABV, though Eric believes the 1970 was probably better, at a riper 13.5%. Of course, most Napa Cabernet was significantly lower in alcohol than typically found today, but recent vintages of Monte Bello rarely exceeded 13.5% ABV, whereas Napa Cabernets today rarely come in below 14.5%. Tasted at Planet of the Grapes, 2015. Planted 2000-2001. 100% Zinfandel. 14.9% ABV. Tasted at Planet of the Grapes, 2018. 69% Zinfandel, 18% Petite Sirah, 11% Carignan, 2% Mourvèdre. 14.4% ABV. From magnum. 1902 vines in the central interplanted plot. 70% Zinfandel, 21% Petite Sirah, 6% Carignan, 3% Mourvèdre. More masculine; needs more time for tannins to soften than Geyserville. 14.4% ABV. Tasted at Planet of the Grapes, 2018. 70% Zinfandel, 15% Carignan, 12% Petite Sirah, 3% Alicante Bouschet. 14.5% ABV. From magnum. Tasted at Planet of the Grapes, 2015. 71% Zinfandel, 19% Carignan, 7% Petite Sirah, 2% Mourvèdre, 1% Alicante Bouschet. 14.4% ABV. Trentadue family sold Monte Bello to Ridge investors & sell Geyserville fruit. First Geyserville vintage became a dessert wine (Essence) due to fruit over-ripeness. More elegant, broad, early-interest wines than Lytton. Drunk 30th July 2016. 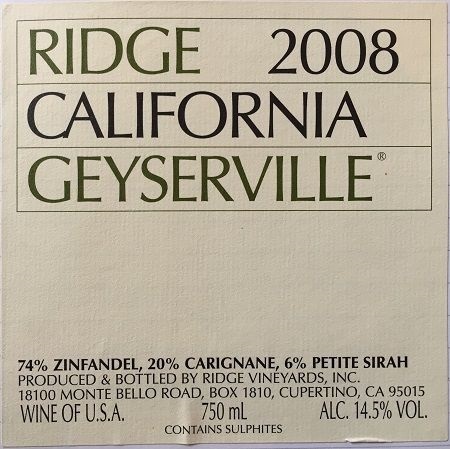 74% Zinfandel, 20% Carignan, 6% Petite Sirah – only included as a result of the field blend component, since Petite Sirah didn’t generally ripen well in 2008. 14.5% ABV. Tasted at Planet of the Grapes, 2018. Monte Bello estate fruit. Unfiltered. Tasted at Planet of the Grapes, 2015. Monte Bello estate fruit. 14.5%. Tasted at Planet of the Grapes, 2018. 14.3% ABV. Tasted at Planet of the Grapes, 2018. Softer tannin extraction and early press. Cabernet Sauvignon on the label but only 75%, with 14% Merlot added to soften the tannins, 5% Cabernet Franc for aroma and 6% Petit Verdot for colour. Typically from parcels that produce less tannic grapes. 13.7% ABV. Tasted at Planet of the Grapes, 2015. 82% Cabernet Sauvignon, 14% Merlot, 3% Petit Verdot, 1% Cabernet Franc. 13% ABV due to cool vintage. Laid reflective roll-up material in vineyard to promote photosynthesis, but harvest was still late October and into November. Plenty of saignée in 2011 to concentrate flavour. 2 years in barrel and designed to be enjoyed young. Tasted at Planet of the Grapes, 2018 and again at US Embassy the same year. 75% Cabernet Sauvignon, 18% Merlot, 5% Cabernet Sauvignon, 2% Petit Verdot. 13.5% ABV. Cool and wet year. 74% Cabernet Sauvignon, 20% Merlot, 4% Petit Verdot, 2% Cabernet Franc. 13.2% ABV. 68% Cabernet Sauvignon, 20% Merlot, 10% Petit Verdot, 2% Cabernet Franc. Hot until late in the growing season, then there was a temperature drop, followed by late warmth, leading to a wine that was structured and austere initially. 100% new American oak. 13.5% ABV. Customer bottle brought along to the Planet of the Grapes dinner, 2015. 56% Cabernet Sauvignon, 36% Merlot, 8% Petit Verdot. 14.2% ABV. 75% Cabernet Sauvignon, 23% Merlot, 2% Cabernet Franc. 13.4% ABV. 86% Cabernet Sauvignon, 12% Merlot, 2% Petit Verdot. 1989 had an earthquake, but limestone bedrock gave stability to the winery buildings and only 2 bottles were lost. Cold and wet year due to an El Niño event, with harvest rain – so Bordeaux-like. 13.4% ABV.